As dairy farmers and those who work in the dairy industry, our interest in milk lies mostly in milk production. Hearing about innovations in dairy processing and trends in consumer demand are interesting to us, but aren?t really what we?re all about. A group of young dairy managers from Ontario County had the opportunity to learn about how supermarkets think about dairy products in April when we met at the flagship Wegmans store in Pittsford, NY. We were hosted by Ron Indovina, the Dairy Category Merchant, who is in charge of purchasing dairy case items for all Wegmans stores. We came away intrigued and a little overwhelmed by the wealth of information shared with us. Here?s a bit of the insight we gained from the other side of the dairy case. 1. Upstate Niagara Cooperative, Inc. supplies Wegmans with all the milk needed for Wegmans brand milk in its 84 stores, which are spread throughout MA, MD, NJ, NY, PA, and VA.
2. Wegmans actually loses money on every gallon of conventional Wegmans brand milk that it sells! This milk is what?s known as a ?loss leader? for Wegmans, meaning that they sell it below market cost in order to increase sales elsewhere in the store. As milk is such a popular item, it?s worthwhile for Wegmans to sell it below cost because it encourages people to come to the store. They can then make up for the loss on milk in the sales of other products. (Another example of a loss leader is the super cheap turkeys sold for Thanksgiving; the store loses somewhere in the neighborhood of 8 million dollars every year on this item.) What items help them make up for that loss? Wegmans? profit margin on organic milk is very high, and this item is growing steadily. 3. Has anyone ever noticed that certain Wegmans brand products are offered only in organic? We asked why. Indovina responded that they would only do that when they can offer the organic product at a price equal to or lower than the conventional product. In one example, Wegmans? supplier for organic carrots had such a small demand that they were very expensive to produce. By giving one supplier all their carrot business, Wegmans made it possible for the grower to supply organic carrots at a lower price. Now Wegmans can sell organic carrots at a price equal or lower to the price for conventional carrots. 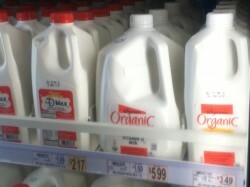 This discussion brought up an interesting question: would Wegmans ever offer only organic milk? Would that even be possible? Some producers said they?d be happy to make the switch if they were promised to be paid a price that would be profitable for them. But the question of whether or not farms would be able to provide the required amount of pasture land necessary to meet organic standards raised doubts. Though touring a supermarket was a very different experience from our usual farm tours, the group?s overall impression was positive. One group member commented on how great it was to be able to meet someone who is as passionate about his job as Indovina. Purchasing dairy products isn?t what dairy farmers are all about, but it?s certainly interesting to hear from someone who is all about it.